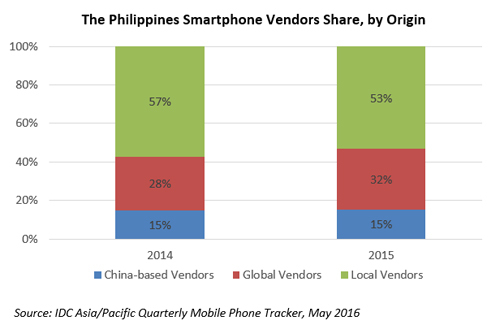 The Philippines is now the fastest-growing smartphone market in ASEAN, and it is providing great opportunities for the country's local smartphone brands. In the first quarter of 2016, the Philippine smartphone market grew 20 percent year-over-year, according to the latest figures from IDC. The country only had a 30 percent smartphone penetration rate in 2015, putting it in a unique position in Asia where other more mature markets have started to become saturated. China is one country that has been contending with a saturated smartphone space. This has had big implications for local makers banking on first-time buyers who are picking up inexpensive smartphones. Now, China has more than 500 million smartphone owners and they are mostly looking to trade up to higher-quality brands, which typically come from Apple, Samsung and Huawei. Other companies have looked for growth opportunity overseas. Less developed markets such as those in Southeast Asia present good areas to explore, but consumers in the Philippines have so far shown a preference for their local brands. According to Tech in Asia, the top local phone brands in the Philippines are MyPhone, Cherry Mobile, CloudFone and O+, in that order. They have dominated the Philippine market, but things are starting to change. In 2015, 44 percent of smartphones in the country has less than 1GB of RAM. That dropped to 38 percent in the first quarter. Tastes are starting to change in the Philippines and this is benefiting foreign brands. Local makers fell from 57 percent of the market in 2014 to 53 percent in 2015. China's stake did not change much, maintaining a 15 percent share, but Oppo and Huawei are "on a steady growth track," according to IDC. Samsung and Asus have also been doing well in the country. Markets such as the Philippines show where growth opportunities exist today. Those are not just going to established players in the smartphone market, either. Philippine brands are doing good and if managed properly, they may be able to grow along with the local market the way China brands did. Foreign companies such as Oppo have also done well focusing on developing markets and areas with low smartphone penetration. It recently allowed the maker to become the fourth-largest smartphone brand in the world by shipments. Samsung has tried to take a multi-tiered approach, targeting the high end of the market with its Galaxy phones and the low end with inexpensive handsets for developing markets. At least in the Philippines, that gamble is paying off. Samsung is still the top smartphone maker in the world, but growth has recently stagnated.